A music video for the new Black Panther film features scenes of striking similarity to artist Lina Iris Viktor’s Constellations series. Is this inspiration or infringement? To promote the film and its soundtrack, American rapper and songwriter Kendrick Lamar, together with American R&B singer SZA, recently released a music video entitled “All the Stars.” However, the producers of the music video are now accused of stealing from African artists. British-Liberian artist Lina Iris Viktor, who currently resides in New York, has garnered praise for her series Constellations. The work is characterised by unique patterning, using what Viktor considers a “purist colour palate” of only black and 24-karat gold. Viktor found out about the music video from friends, who had called her to say they had seen Constellations featured in the video. The alleged infringement begins three minutes into the video, and lasts for about 20 seconds. Viktor was previously contacted on two separate occasions in respect of using her work in association with Black Panther. In the first instance, a set decorator asked Viktor directly if he could feature Constellations in the film itself. On the second occasion, a public relations firm contacted the Mariane Ibrahim Gallery in Seattle, which represents Viktor. The PR firm wanted Viktor to provide Marvel Studios and Disney with artworks to promote Black Panther. In both instances, Viktor declined the opportunity to be associated with the film, for reasons apparently related to financial terms and exclusivity. Constellations and “All the Stars” call into question the fine line between infringement and inspiration. Style and general colour schemes are not protected by copyright law, regardless of the form in which it is illustrated or embodied (17 USC Section 102(b)). Segments of Kendrick’s music video clearly appear to have been inspired by Viktor’s artwork. There are several striking commonalities with the patterns and colour schemes used, and certain actors’ poses mimic Viktor’s portraits. One could even argue that the name “All the Stars” echoes Viktor’s Constellations title. The Court will analyse if the ordinary observer, unless he set out to detect the disparities between the works, would be inclined to overlook them and regard the aesthetic appeal of the two works as the same. This means looking at the overall visual effect — the total concept and feel — regardless of the individual elements that may have been changed, added or even removed. 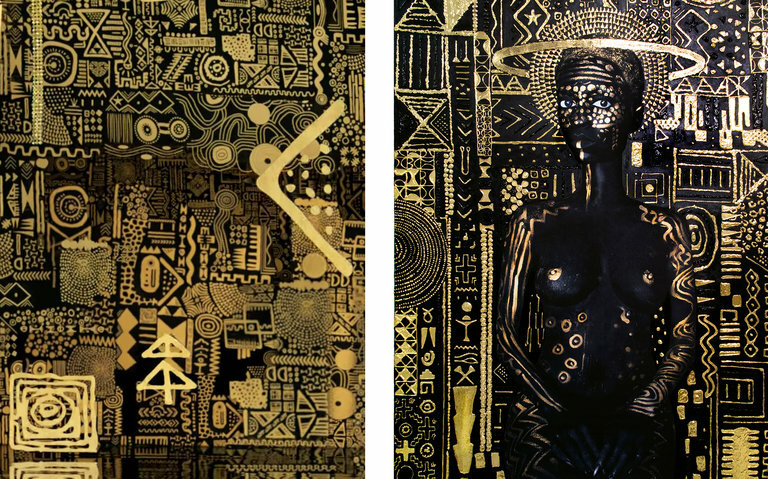 Left, an image from the video for “All the Stars” (Universal Music Group); right, the painting “Constellation I” by Viktor (Mariane Ibrahim Gallery). At present, no official lawsuit has been filed at court. The letter simply asks the “All the Stars” crew to discuss a resolution of Viktor’s claims, “consisting at a minimum of a public apology for the unauthorised use and a license fee.” In her interview with The New York Times, Viktor explained that these allegations are “an ethical issue” and not about monetary compensation. She noted that the film’s creators focus on black empowerment and African excellence, but at the same time appear to support what she considers cultural appropriation. Lamar, Top Dawg, Marvel Studios and Disney have not yet responded to the allegations. In an attempt to settle this allegation as quickly as possible, and indeed – to protect the narrative of promoting African and African American artists in general – Black Panther producers may simply choose to give Viktor an apology and a considerable licence fee. Given that the film is expected to smash box office records, and the Black Panther soundtrack has likewise become a hit with audiences, coming up with compensation is unlikely to be too much of a problem.